Upstate Vet provides advanced medical, surgical, neurological, cancer, dental and eye care for pets in Upstate South Carolina, Western North Carolina, and Northern Georgia. With full-service hospitals located in Greenville, SC and Asheville, NC, Upstate Vet provides advanced medical, surgical, neurological, oncological, dental, and eye care for pets in Upstate South Carolina, Western North Carolina, and Northern Georgia. We offer a broad range of advanced medical technologies and skilled, compassionate care in state-of-the-art facilities. For medical conditions that are non-emergent, we take patients by referral only, which means that your regular veterinarian must contact us prior to you making an appointment. We will work in conjunction with you and your veterinarian to make the best choices for you and your pet. Upstate Vet is accredited by the American Animal Hospital Association. 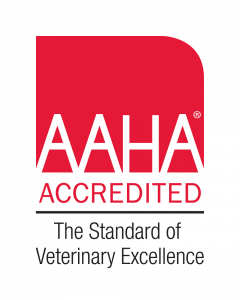 We chose to be continually evaluated for accreditation by AAHA because it challenges us to stay at the forefront of all the latest changes in veterinary medicine and practice operations. AAHA has truly helped us reach our goal of providing the best in personal, quality care for our patients and clients. And in 2011, Upstate Vet was honored for our work by receiving the award of Specialty Hospital of the Year in North America from AAHA. Our after-hours emergency care is the only fully staffed after-hours emergency facility in the Greenville area. The clinic was established in 1978 to provide quality after-hours emergency and critical care support to local veterinarians and their clients. The mission of the Upstate Vet Blood Bank is to provide a humane source of veterinary blood products for dogs and cats in our community. We rely on volunteers who allow their pets to be blood donors. Our blood products support our clinic needs and surrounding area clinic needs. What can my pet and I expect at Upstate Vet? At Upstate Vet, our skilled specialists and staff are at the heart of what we believe: that providing excellent patient care requires clinical expertise, a commitment to quality, and compassion for the patient. That’s why everyone at Upstate Vet—from doctors to nurses and support staff to senior leaders—works as a team to deliver the best possible care and service to every patient. Our specialists on the medical staff at Upstate Vet are experts in the fields of surgery, neurology, internal medicine, cancer management, dentistry, and eye care. We use advanced technologies to provide excellent care for our patients every day. We stay in constant communication with your family veterinarian to ensure that they, too, are part of your pet’s health care team. We strive to create a patient experience that exceeds your expectations. Our goal is continuous improvement so that patients can get better quickly and stay healthy.